This is the site of the Synod of Austerfield in AD 702. 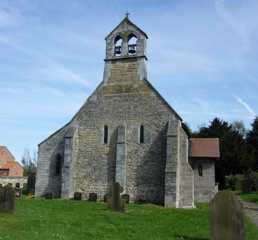 The church was originally a Norman chapel-of-ease to Blyth Priory, built by John de Buisli in the 12th century. The parish was separated from Blyth and combined with Bawtry in 1858. Although Austerfield is in Yorkshire it has historically formed part of the Archdeaconry of Nottingham and, more recently, the Diocese of Southwell & Nottingham. Built of rubble and dressed magnesian limestone, the church consists of a three-bay nave and a one-bay chancel separated by a 12th century chancel arch, a south porch, a two-bell west turret, a north aisle and vestry. It was restored and extended by Charles Hodgson Fowler in 1897-8 when the north aisle and north vestry were added. Features from the 12th century can be seen in the chancel arch, the well preserved north arcade, the reset door in the north aisle and the unrestored south doorway with its tympanum bearing a carved dragon. There are Perpendicular windows of the 14th century in the nave, north aisle and chancel and two lancets at the west end. There is a rustic Jacobean communion rail with turned balusters. The piers of the north arcade are round and the central one has a rare sheela-na-gig. There is some late 19th century stained glass and a window showing William Bradford and the Mayflower installed in 1992. In 1897 the north aisle was built in memory of William Bradford. He lived in Austerfield and worshipped here and at Babworth. He was one of the Separatists who sailed in the Mayflower in 1620 and became Governor of New Plymouth.